If you would like to receive a short email telling you when a new Newsletter is available – just follow this link and complete the form. Bit of history first: The Otter Trail Group has been set up by teachers and students at The Kings School in Ottery St Mary to pursue the possibility of re-opening the old railway line from Feniton to Sidmouth as a cycle path. This would not only benefit students in safely transporting themselves to school but would encourage cycling to the wider community. 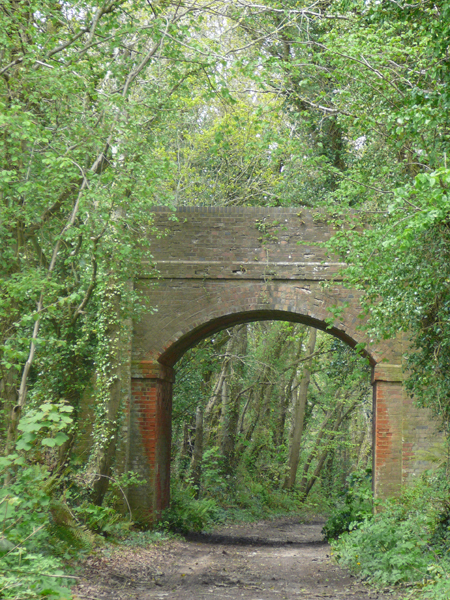 Although a great idea, the old railway line is now owned by several private landowners, some of whom are understandably reluctant to part with land so gentle negotiation and possible alternative route planning needs to happen first. 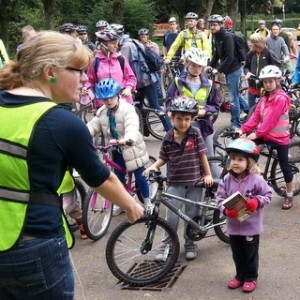 Sustrans have carried out a positive feasibility study. In the meantime, the group are keen to promote cycling although the majority of the members are not experienced cyclists. Many are wary of the roads or unsure of “safe” routes but this hasn’t curtailed their enthusiasm for organising cycle rides. Hence the 50 km “Challenge Ride” starting in Ottery and following Cycle Route 2 to Exmouth and Lympstone – meeting up in Exmouth with a group doing a shorter ride. Since the proposed Otter Trail is on my home turf I thought I’d tag along with the group for a nice gentle pedal and simply enjoy the scenery. A quick glance at the email beforehand with its familiar resemblance to the CTC Bike Bus timetable should have alerted me to who was behind the route planning and his associated enthusiasm for allowing others to gain opportunities for leading rides. 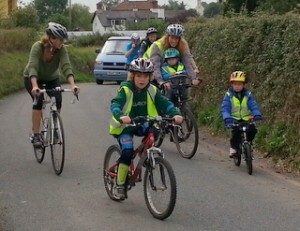 Therefore I found myself leading a group of previously unknown but deadly keen budding cyclists to Exmouth! It was encouraging to see a diverse group of people including a couple of families just venturing out on riding together, a young girl with a brand new bike who had so far only ridden around Ottery and an older gentleman on an electric bike. They all kept up a remarkably good pace. After collecting some others on Tipton Bridge, we were joined in Exmouth by another group including two of East Devon’s Independent Councillors, Claire Wright and Roger Giles – Claire had a young child in tow. Along the way we chatted about cycling in general with tips on road safety, riding in groups, basic bike maintenance etc. It reminded me that only five years ago I was like most of these people: not sure how far I could cycle in one go, unpractised in gear changes, no idea how to get my chain back on without getting oily (still haven’t quite mastered this one), nervous of busier roads, easily saddle sore (I owned a wide saddle with the alias of “the armchair” in those days), often getting off on hills and very quickly becoming out of breath. It was thanks mainly to the CTC Bike Bus that I quickly overcame these discomforts and went onto do all sorts of things which I would never have previously thought possible! Some of the feedback we received expressed thanks for a “lovely ride”, for “inclusive guidance” and that it had “sparked off a lot of interest”. So it was a real joy to have had the opportunity to encourage others just as I had been through joining the CTC in the hope that these folk will keep pedalling until one day they find themselves on a new Otter Trail. 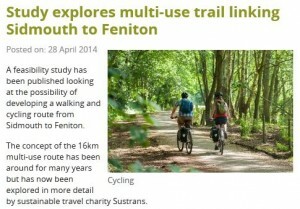 Sustrans have published their feasibility study on a multi-use trail linking Sidmouth to Feniton. The concept of the 16km multi-use route has been around for many years but has now been explored in more detail. The study has been produced following a community meeting last year which highlighted the need for the report as part of the legacy work of the construction of Coleridge Bridge in Ottery St Mary, which opened to the public in August 2011. The concept of a trail broadly follows the line of a dismantled railway and takes in Tipton St John and Ottery St Mary although the study reviews a number of route options. Many sections of the old railway line have been built on, and 28 private landowners have so far been identified along route options. We have also assessed the benefits and challenges of developing a multi-use trail across East Devon, at an estimated construction cost of around £1.4 million, although the provision of a bridge over the A3052 at Bowd which is desirable would potentially double the construction costs. Any possible route would have to be delivered in sections over a number of years and would serve around 26,000 residents. The aim would be to develop a route that is convenient, safe, accessible and attractive, in order to provide local communities with a realistic alternative to the car to encourage people to travel by foot, cycle or horse. It could potentially generate around £600,000 per year of additional spending in the area from cycling visitors. Between 80 and 100 residents flocked to Ottery’s Land of Canaan car park on Saturday 21 September at 11am, for the start of a family cycle ride to Escot Park. Stalwart police community support officer, Maria Clapp, was on hand to distribute high visibility jackets. From the Thorne Farm Estate, the group cycled up Barrack Road and then turned right into Cadhay Lane and travelled along the lovely quiet lane, with magnificent views over the surrounding countryside. Then it was over the old A30 before freewheeling down the hill into Escot Park. There was lots of children on bikes, toddlers strapped to their parents bikes and an atmosphere of happiness and excitement. Even Sir Wiggins himself (or at least someone who looked like him) made a brief appearance and gave a rousing speech at beginning of the event before heading off to Guildford for the next stage of the Tour of Britain. I wore a pair of “Wiggo” sideburns, but I not sure they worked. Certainly, from the furtive looks I got in Sainsbury’s I am not sure that people realised that they were actually stuck on. Although someone (rather surprisingly) said they looked “quite nice” – ? I have attached a photo of what my husband has dubbed “The Werecouncillor.” Next to me is Claire Sheridan, one of the Otter Trail campaign group. There is an album of other photos on-line. When we arrived at Escot we bought sandwiches and cake and drank cups of tea. It was all very jolly and sociable. 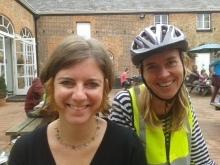 Special thanks go to Jo Elliott, King’s School teacher, who masterminded the event with Claire Sheridan and Helen Collinson; Kirby James, who took some pictures and his expert cycling training colleagues, Graham Heysett, Teresa Golding and Ross Clarkson. Oh and Sir Wiggins (aka Cllr Roger Giles). PS. If you haven’t already signed up to the petition for the Otter Trail (see front page of the website) please do! In the bike rack in The King’s School why do more cycles belong to staff than pupils? In a recent meeting I had to explain to Devon County Council that the roads to our school are too dangerous for students to cycle to school safely. We live in a beautiful rural community where we should be promoting healthy lifestyles, reducing obesity levels and being active model citizens but at present the cars reign supreme on our roads. The benefits of cycling is finally being targeted by the Government and funding is now available for providing sustainable travel options and we as a community want a slice of that financial pie! A cycle path from Feniton to Ottery would entice visitors from the main train line to our area and be a vital boost for tourism. I can already see Phyllis (our trusted Tourist information officer) handing out the route maps. Our multi-use path could then continue onto Tipton and be enjoyed by all the different generations within our community but we have to prove this is what our area wants. Our online petition has over 500 signatures which is an excellent start and if we all, like the Primary and Secondary Headteachers, want safe routes to schools and safe effective multi-use paths in our area, we need many more people to visit our website and record their voice. The final route has not been decided upon and a feasibility study needs to be carried out to establish the most agreeable route possible. Our group meets regularly to actively campaign alongside our Sidmouth counterparts to gather support and liaise with other significant parties as otherwise the funding available will go elsewhere in the UK. To celebrate the opening of the Tour of Britain and to raise awareness of our campaign, we are organizing a Family Fun Cycle ride on 21st September. The ride will begin in Ottery at 11am in the land of Canaan car park and continue onto Escot Estate where we can enjoy a picnic lunch. We will be supported on the day by cycling experts and cycling trainers so the ride is suitable for all members of the family. We are so privileged to live in an area with an active community that is committed to developing our town. A cycle path would hugely benefit our area bringing improved health, tourism and our general quality of life. Please visit www.ottertrail.org, sign our petition and spread the word. 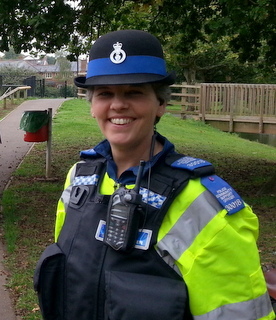 Jo Elliott – Chair of the Otter Trail cycle committee. Although we may live in an idyllic part of Devon, many of the routes between our towns and villages were, unfortunately, not designed for 21st century traffic. This has not been improved with the number of cars and lorries on our roads doubling in the last 40 years. Vehicles are now bigger, always in a hurry, and meeting a cyclists is often frustrating for all concerned. As a result, cycling has become increasingly dangerous and sadly many parents will no longer encourage children to cycle to school, to friends or for pleasure, in the way they perhaps remember doing themselves. To provide a safe alternative, the idea of an off-road cycling, walking, multi-use trail between Feniton, Ottery and Sidmouth has raised its head a number of times. So where are we now? An open meeting was held at The Kings School, in October 2012, to re-launch the idea to those with an interest , either as a landowners, business owners or potential user. Since then, a small group of volunteers have met to investigate the way forward in the Ottery area. They have been working alongside students from The Kings School and members of the Sidmouth Vision Group who are doing likewise in the Sidmouth area. An important development, in recent years, is the increased commitment by Devon County Council (DCC) to ‘sustainable transport’. DCC now has an established Devon Cycle Strategy and in the past 3 years over £13 million has been invested in the cycle network and cycle safety throughout Devon. 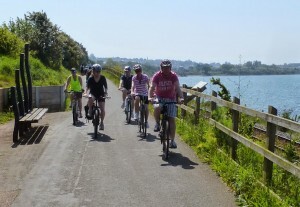 This has helped to fund schemes like the Exe Estuary Trail, Gem Bridge near Tavistock, the Town Quay Connect 2 bridge in Newton Abbot and connecting paths to Kingsteignton, phase one of the Wray Valley Trail, and a section of the Stop Line Way from Kilmington to Axminster. DCC are planning to continue investment in cycling over the next five years and have already identified a new route connecting Feniton to Sidmouth as a prime contender. It is clear that with the backing of DCC, a complex project like this is far more likely to succeed, but it’s not guaranteed. The ‘Otter Trail’ will be competing for funding with other similar projects throughout Devon. Nevertheless, the Otter Trail ticks lots of boxes … linking to schools, linking to the main London train line, linking the towns and villages of Sidmouth, Tipton St John, Ottery St Mary and Feniton, which are all growing in population. The potential benefits to local business and tourism are also significant. There has been no formal agreement over a route, however, the first choice has generally focused around the old railway line between Feniton and Sidmouth. Unfortunately, since the closure of the railway in 1967 most has been returned to local landowners and, although some of the railway route is still visible, and some now a public footpath, many landowners have naturally become accustomed to farming without a right of way intruding in their business. At a time when the farming industry is under great pressure it is clear that the extra intrusion of a new path is not generally popular. It would, no doubt, affect some farms more than others but, of course, in some cases may also bring opportunities. So, it’s hoped that landowners will be more supportive when there is more detail about ‘where, when and how’ it might work. In many places an alternative to the railway route would still have to be found, to get around buildings, gardens and other structures. These issues are not unique to the Otter Valley. There are a growing number of cycle paths around the country which have all faced similar challenges, and solutions found. Government policy is still looking to develop more of these links around the UK and the charity Sustrans (www.sustrans.org.uk), who are working closely with the Otter Trail Group, have been a key facilitator in many of these projects. If there is enough local support now there is a better chance of this happening than ever before. 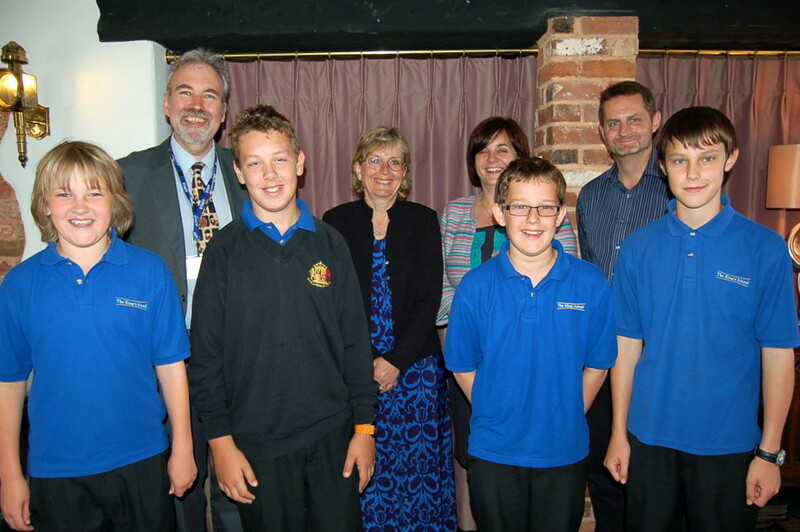 Ottery St Mary have a good record of council, school and community cooperation in making things happen. This has been demonstrated following the successful completion of the Coleridge (Connect 2) Bridge, which was recently highlighted as a nationwide example of community led development. At their stand at the Ottery Food & Families Festival the Otter Trail Group saw overwhelming interest and support for the project, from all ages, interests and abilities. This project will, however, need lots more public support if it’s going to succeed.